Lady Elsie, Captain Nelson, patrons, ladies and gentlemen, friends, colleagues and sponsors, thank you all for your attendance today. My name, for those of you who don’t know, is Mark Allison and I am an volunteer fundraiser for The Sir Bobby Robson Foundation and The Children’s Foundation. 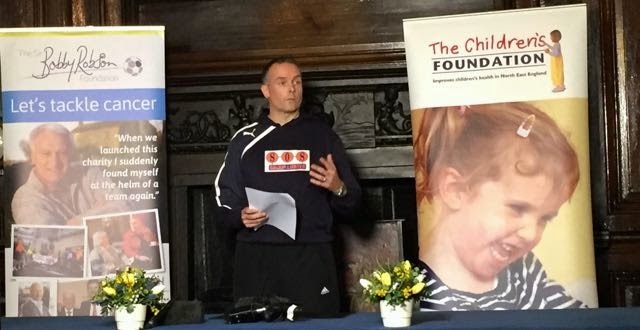 I’m thrilled to be able to share the details with you of a most momentous fundraising adventure to be undertaken by myself, using the Run Geordie Run brand, in 2016. For over 500 years Trinity House has served the local community and beyond with many good charitable deeds. I can’t think of a more appropriate setting, steeped in so much history and tradition, in which to share my plans with you today. I’d just like to take a moment to remind everybody how I came to be standing here today. How is it that an ordinary Geordie in the street is standing in such a grand old place addressing a Lady, a Captain and so many esteemed guests? Had things have worked out differently for my family then I may not have been standing in front of you at all today. When my parents were taken from me when I was just a young man I could have done 1 of 2 things. I could have let the grief consume me and tear me apart (I must admit that it nearly did) or I could do something positive and put to good use the debt of gratitude I feel to local charities for at least trying to help my parents and for making their final days battling cancer as comfortable and dignified as possible. Fortunately, I chose the latter option and it has helped to ease the burden of grief that I have carried with me every day since I lost my parents. It is a most terrible dark feeling that is as painful in my heart right now as it was all of those years ago. Thankfully, through fundraising, I have found a way to control and even some days numb the pain. 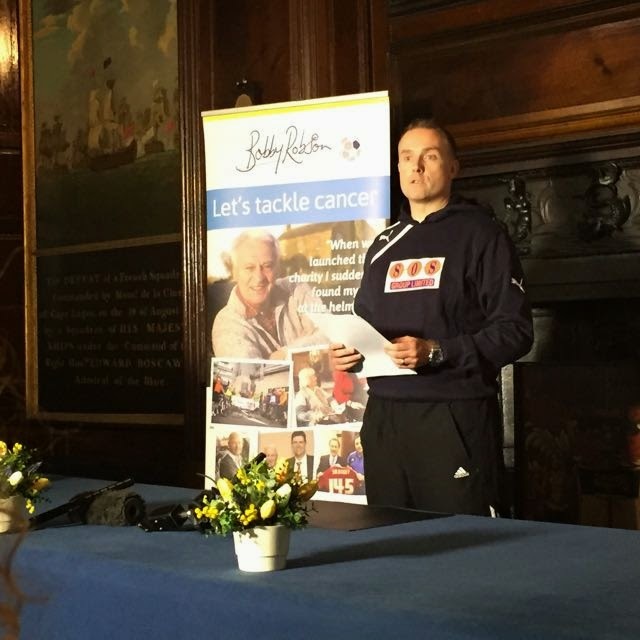 There is no doubt in my mind that raising funds for such good causes as The Sir Bobby Robson Foundation and The Children’s Foundation has been as beneficial to me as it has to them and the beneficiaries of their charitable good deeds. Ladies and gentlemen, I do realise that my story is no different to many other peoples’ in this room today or in the street outside. We have all lost loved ones. It’s what we do, in their memory, for the greater good of others that is so very important. It was not long after I returned from finishing the run across Australia in January this year that I had a very vivid dream. I could see myself running from John O’Groats to Lands End as I did in 2007. I could then see myself running from California to New York as I did in 2011. The dream then turned into a nightmare as I was reminded of the traumatic and painful times during the run across Australia. I’m not sure if it was the same dream or a subsequent one later that night but I could see a map of the planet with lines drawn across it in thick black pen. Those lines just so happened to be the places that I’d ran; top to bottom of the UK, across the USA and across Australia. What a shame, I thought, that there were parts of the map with no lines on at all. It was at that moment in my deep sleep that I knew where my next run would be. With so many blank spaces on the map there was so many possibilities. I noticed that Europe had no line across it. Asia had no line across it. Japan had no line across it. New Zealand had no line across it. So many places to choose where to run next. Where could I choose? Where could I choose? Ladies and gentlemen, it is my immense pleasure to tell you exactly where in the world I have chosen to run next. Ladies and gentlemen, I intend to run to fill in all of those blank lines on the map until a complete circumnavigation on land is made of the world. Ladies and gentlemen, you heard that correctly, this is a run around the world. Upon completion, if I were to ever have that dream again, I would see a line across the USA, down the UK, across Europe, across Asia, across Japan, across Australia and across New Zealand. The run around the world will be done in 8 segments as family, financial and employment circumstances allow. The beauty of this plan is that I’ve already ran 3 of those segments. Little did I know that when I was running from John O’Groats to Lands End, across the USA and then Australia that it would actually become part of a run around the world. I expect the 8th and final segment to be completed by 2024. 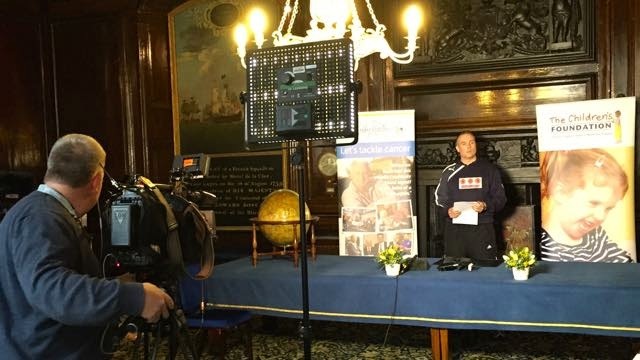 Whilst not pursuing a world record, the event is following 2 aspects of the Guinness World Record criteria used in cycling for “fastest circumnavigation of the globe by bicycle”. The purpose of this is to give credibility to the claim that I will “run around the world”. The criteria is as follows. I must run a minimum of 18,000 miles and I must run through two approximate antipodal points (i.e. opposite points on the planet). The route around the planet that I have chosen is actually 20,000 miles and will take approx. 608 days to complete. The segment in 2016, will see me run across Europe starting in Lisbon, Portugal. The route will then take me through Spain (where I will run through La Coruna which is the opposite point on the planet to Christchurch, New Zealand). I will then run through Andorra, France, Italy, Switzerland, Germany, Austria, Croatia, Serbia, Bulgaria, Greece before reaching the finish line in Istanbul, Turkey some 3580 miles and 100 days later. The distance to be ran in 2016 is unprecedented. The challenges won’t just stop there however as I’m sure the support team and I will be faced with many cultural and languages differences. The European segment during the Summer of 2016 will be without doubt my greatest challenge to date, certainly putting the run across the USA and Australia in the shade. There will be another fundraising target of £50,000 for The Sir Bobby Robson Foundation and The Children’s Foundation and with a lot of luck and generosity the 1/4 million pound barrier should be broken. In 2018 I will start in Istanbul where I left off in 2016 and make my way through Turkey, Georgia, Russia and all the way across Kazakhstan to the Chinese border. That is a distance of 3700 miles to be ran in 110 days. At this moment in time I have no idea how I’m going to execute the logistical side of that run. It’s mind boggling as is the distance and the even greater shift in cultural change that I will see. In 2020 I will start at the Kazak/Chinese border where I left off and run 3000 miles across China to meet the Pacific Ocean in Shanghai in 84 days. In 2022 I will run from the southern to the northern most points of Japan. That’s a distance of 1800 miles to be done in 50 days. Finally, in 2024 I will run from the northern most point of New Zealand, passing through the opposite point on the planet to La Coruna, Spain which is Christchurch before completing the 20,000 mile distance in a total of approximately 608 days. That’s roughly 1 year and 8 months. Ladies and Gentlemen, I’m sure you’ll agree that this is an ambitious plan. 20,000 miles is an incredibly long way. But I stand here today having already ran 6358 miles. The remaining 13,642 miles promises to be an amazing and I intend to take people with me on the journey with me through my website and numerous social media channels. I’m sure the media will back me as they have done so brilliantly in recent years too. The run around the world is the reader's, the listener's, the viewer's and the sponsor's journey as much as it is mine. I’d like to finish proceedings by thanking Captain Nelson and the staff of Trinity House for letting us use their fantastic premises. Thank you also to my sponsors, Cherry Active, Chapman Ventilation, SOS Group, Virgin Money and Sport Newcastle, without whom, there would be no run in 2016 to tell you about. Their support and generosity is as critical to the success of the 2016 segment. Lady Elsie, Captain Nelson, patrons, ladies and gentlemen, friends, colleagues and sponsors, thank you all for listening and sharing in this particular part of the journey.